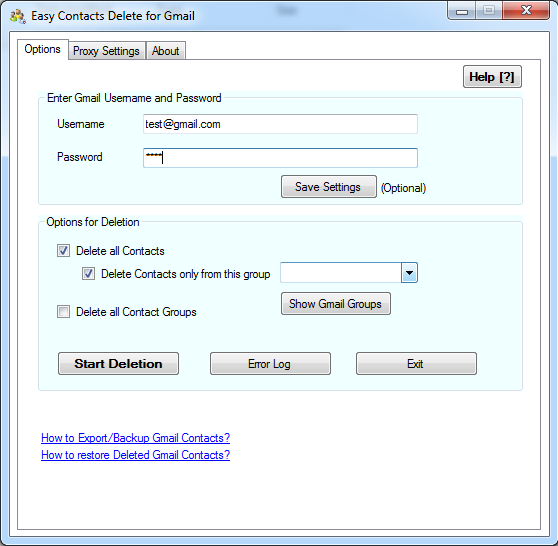 Delete all Contacts in your Gmail account at once. Delete all Group names at once. Option to choose a single group to delete the contacts under that group. Download Portable version (.zip - 310 KB) Just download and Extract. This version is recommended for users who do not have admin access. Email support@pppindia.com for any issues or to recommend any new options. Contacts Sync - Synchronize Outlook Contacts with Gmail - Freeware and Pro version. 2way contacts sync, sync Outlook Categories, pictures, notes, sync by last changed contact, preview sync and more. Email Extractor for Gmail - Extract Email address from Gmail - Extract and Download unique Email addresses from your Gmail inbox and labels. Extract emails in From/To/CC headers. Download extracted emails as .csv file. Extract From/To/CC/Reply-to, all at once. Extract from unread /new mails. Extract from message body and Sent Mails. New Android Apps to extract all email addresses from your Gmail, Yahoo, Outlook.com, iCloud, Office 365 mailbox and from any IMAP email account. Available from Google Play. Visit www.allemailextractor.com to know more. Calendar Sync for Outlook and Google. Sync Outlook Calendar with Google Calendar. 1-way, 2-way Google and Outlook Calendar Sync. Freeware. Visit gmailextractor.com to Extract Email addresses from Gmail Inbox & mail folders/labels. Download extracted emails as .csv file. Extract email ids in From, To, CC. Extract from message body, Sentmail. Extract from unread mails. Gmail Email Extractor. Contacts Sort for Gmail™ is a Chrome browser Extension that displays your Gmail™ Contacts in a business card layout similar to Contacts view in MS-Outlook. You can also sort the contacts in different ways like - by date added or by oldest, by contacts with or without pictures. Download Gmail Attachments - Free Android app to extract and download attachments from your Gmail. Choose your Gmail folder and download all attachments or filter emails to extract by sender's email, date, message size and more. Download Gmail Attachment Extractor from Google Play store. SEVAL Email Extractor, Email Validator. Copy text from any document to clipboard, SEVAL email extractor extracts emails from clipboard, validates, removes duplicates and lists them. Download | more..
SMS without Mobile Phone. Two-way SMS without Internet or SMS gateway. Send, Receive SMS using GSM or 3G modem. Send SMS from Excel sheet, Merge/Personalize each SMS. Send SMS in any language (Unicode). Download Now. Automatically receive SMS and store into any database like MySQL, MS-SQL. Extract Email from Yahoo Free IMAP Email Extractor for Yahoo and any email account. Download from Google Play. Mobile Number Locator - Trace the location of any Mobile Phone number in India. Social Share Count Checker and Android App. Get social shared count of any website.